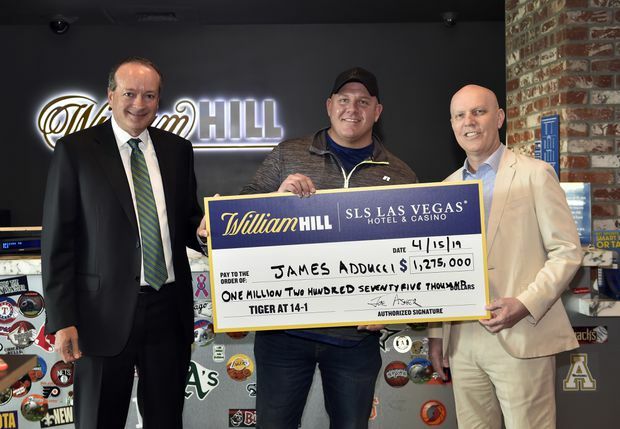 William Hill US CEO Joe Asher, from left, James Adducci and SLS Las Vegas general manager Paul Hobson stand with an ceremonial check of Adducci's winnings of $1.2 million after cashing his winning ticket at the William Hill Sports Book at SLS Las Vegas Hotel on April 15, 2019. James Adducci was presented with a check for more than $1.2 million Monday at a sports-book in Las Vegas. Adducci’s win represents the largest golf payout ever for sports-book operator William Hill US. Joe Asher, CEO of William Hill US, authorized the bet after getting a call from the sports-book. Adducci flew back to Las Vegas on Monday. Joined by Asher and SLS casino-hotel general manager Paul Hobson, he smiled while posing for pictures holding the check for $1.275 million – his original stake plus the payout of $1.19 million. Adducci said he is now considering using the money for other bets.